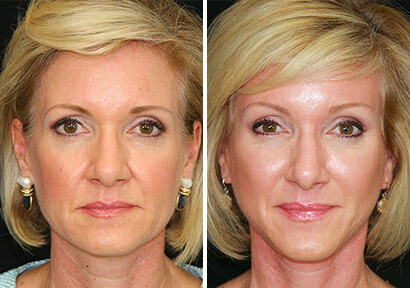 The natural facelift is one of the procedures for which Dr. Mark R. Murphy, premier facial plastic surgeon, is known. Delivering one of the best facelift West Palm Beach has to offer, he has crafted an impeccable surgical approach that patients love, because it ensures that they emerge from their surgical procedure with a naturally more youthful appearance that looks fresh and organic – never overdone. A facelift is a surgical procedure used to reduce the creeping lines and wrinkles of age and stress on one's face. Our Boca Raton facelift surgery can gently erase the effects of time, stress and exposure to the elements that have accrued over time. To perform this procedure, facial plastic surgeon Dr. Murphy, will lift and tighten the underlying muscles of the face to create more aesthetically pleasing contours appearance and rejuvenate the facial structure. You possess signs of facial aging, such as wrinkles, lines and sagging skin. Your facial appearance looks older than you feel. Dr. Murphy is a specialist in face and neck rejuvenation procedures. As a double board-certified facial plastic surgeon, his experience and aesthetic approach to facial rejuvenation can allow you to achieve your vision of a younger and fresher look. His aim is to subtly restore the shape of the face while maintaining a natural and untouched appearance. Prior to your facelift surgery, you will have a private consultation with our facelift surgeon, Dr. Murphy, in his Palm Beach Gardens office. During that meeting, he will spend a great deal of time with you discussing your cosmetic concerns and goals for surgery. From there, he will carefully assess the signs of aging you’d like to address, before offering personalized recommendations regarding how he can help you achieve a naturally more youthful and refreshed appearance. To begin your procedure, Dr. Murphy’s team will administer twilight anesthesia, to ensure a safe and pain free surgery. From there, he will create incisions that allow him to access your underlying facial muscles and tissue. In most cases, the incisions will begin at the temple, then proceed down along the natural creases in within the ear, for near complete camouflage of the incision, and behind your ears and into the patient’s hairline. Through those openings, Dr. Murphy will address your signs of aging using a deep plane technique, which requires the highest level of skill and artistry. It’s the ideal approach to facial rejuvenation because it provides the most natural and longest-lasting facelift results possible, with the smallest risk of scarring and complications. Instead of pulling skin tight and removing the excess tissue, a deep plane facelift focuses on releasing and repositioning the underlying muscles and fat, returning them to their more youthful and natural positions. Throughout your procedure, you can be assured that Dr. Murphy is operating with his signature conservative approach, which is key to avoiding a pulled-back, artificial or overdone look. He will make very subtle, artistic alterations that allow him to address virtually any sign of facial aging, including deep creases below the eyes, sagging skin on the cheeks, lines around the mouth and excess fat and skin around the chin and jawline. Once Dr. Murphy has successfully rejuvenated your facial appearance through his facelift Boca Raton surgery, he will meticulously close the incisions to ensure that any resulting scars are very faint and difficult to see once you’ve fully healed. A facelift Boca Raton is a fairly intensive procedure and, as such, it’s associated with a recovery period. In general, you can expect to stay home from work for ten to fourteen days and avoid strenuous exercise for three to four weeks. However, Dr. Murphy will provide you with a personalized timeline during your post-operative appointments. Immediately after your procedure, it’s normal to experience bruising, swelling and discomfort in the treatment area. However, all of these effects will subside gradually as you recover. You will see Dr. Murphy’s team every other day for the first week of surgery to ensure a seamless recovery. You will be advised to keep your head elevated to minimize swelling and take your pain medication as directed to manage any discomfort. We invite you to meet with us in a private consultation and discuss your options for a more revitalized appearance. Dr. Murphy’s knowledge and expertise will set you at ease. Our goal is to assist you to turn your concept into reality – and leave you with a look that is natural, fresh, and restored. You can also review our before and after gallery to see the quality of the work Dr. Murphy performs. If you feel like your face has lost elasticity and is noticeably drooping or you have wrinkles and lines that feel too prominent then a Facelift could be the choice for you. How Much is a Facelift? A Facelift can cost on average about $15,000 but this depends on the extent of the procedure. Quality is an essential and worthwhile investment. The quality of your plastic surgeon is extremely important. Taking care to select a trustworthy, experienced and board-certified surgeon is the best option for quality results. Meet with us and look over our gallery of before and after images to assist you to make a decision. Depending on the extent of the procedure and whether or not it is being combined with other procedures it could take in the range of 2 to 6 hours. You will be advised to restrict your activity and stay home from work for up to two weeks depending on the extent of the procedure. Any strenuous activity should be avoided for up to a four weeks post-surgery. Bruising and swelling of the face are expected during this time and there will be discomfort in the treatment area. You will be advised to keep your head elevated while resting to reduce swelling and you will be prescribed pain medication to alleviate any discomfort. The results last for varying lengths of time depending on your age, the condition of your skin and the procedure itself. In most cases, the refreshed look lasts up to ten years, or longer. Financing is available, talk to our friendly administrative team about the options that will suit your budget.